Nollywood child actress Regina Daniels who is also a model, recording artiste, singer and a philanthropist is no doubt doing well for herself in the movie industry and has made a name for herself. She reportedly joined Nollywood in 2007 and rose to stardom in 2010 after starring on the blockbuster movie “Miracle Child” which was a tragedy movie. Interestingly,Regina Daniels is still in secondary school but she is already a mega star and reportedly earns N600,000 per movie and she has starred in movies with top Nollywood stars like Genevieve Nnaji, Ini Edo and Chika Ike. Regina currently has a fan base of 500,000 unique followers on Facebook and on Instagram andhas a charity organization which she called “Regina Daniels Foundation” the organization is aimed helping people with physical challenges. 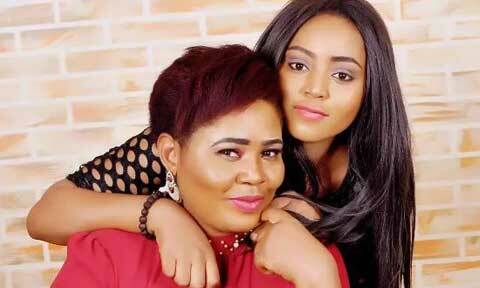 Undoubtedly,this teenage actress is actually amassing wealth from her hard work and has decided to say ‘thank you’ to her mother who is the brain behind her success as she took to her social media and posted a photo of herself and her mom and announced she just got her mum a new iPhone 7+. The phone is estimated to be about N293,000 and has amazing features for her mother’s pleasure.